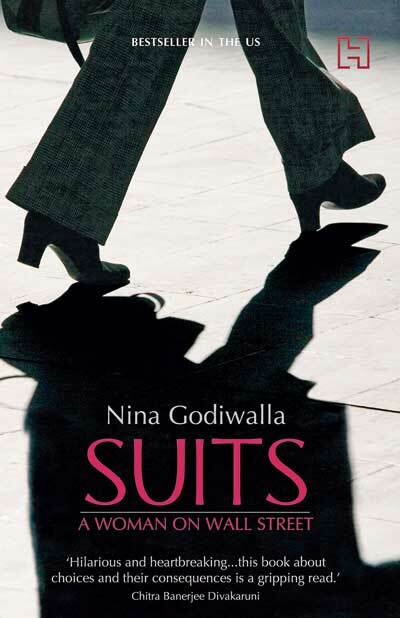 Suits by Nina Godiwalla is a racy story of a young woman who finds that the values and principles that she believed to be important are at loggerheads with those that the world deems to be essential. I really enjoyed this book. Suits is a semi-autobiographical book written by an Indian-American woman who is just starting out on an exciting and challenging corporate career at Wall Street, NY. To me a good book or even a good movie is one which I can relate to, a story in which I can maybe see a little bit of myself or characters who reflect a facet of myself however minuscule it might be. That is the main reason why I don’t enjoy the current trend in Tamil cinema, where every other movie is set in a rural milieu. While such “offbeat” movies which are in fact, rapidly becoming mainstream ones might actually have a good story and talented actors, and I can of course understand the situations, I cannot put myself in their place, I cannot see myself as one among them. Now why am I talking about movies when this post is about a book? Silly me! So in Suits, despite the fact that I am neither Indian-American nor do I have a high-blown corporate career nor am I by any stretch of imagination a finance whiz, I could still identify with the protagonist. I “get” what she says. It is an engrossing tale set in modern times and talks about what Nina had to face at her workplace on the prestigious Wall Street. By being an immigrant as well as a woman, she turns out to be a minority within a minority. Her saving grace is that she is almost “Americanized” with her looks and her accent and so although she escapes a vast majority of the discrimination, she still witnesses it being directed at more “fresh of the boat” colleagues. While I do agree that one does need to blend in and not stick out like a sore thumb, the whole atmosphere described in the book is dead set against anything or anybody who can be considered different. The mantra practiced is Conform, Conform, Conform! Add gender discrimination to the list - if you are a woman who dresses stylishly, you’re a bimbo or if you are too social, you’re just all-talk-and-no-work. When I was working in the corporate sector, I guess these issues did exist somewhere below the surface. When people talk about sexual or racial harassment in offices, most of us might think, “Oh but I wasn’t harassed at all!” Well good for you and I must say that I wasn’t either. But one cannot deny that undercurrents were present nevertheless. For instance, in one of my project teams I happened to be the only woman. So when the guys headed out for a smoke break with the manager or bonded over a drink – what was I supposed to do? Even if I drank or smoked, could I just go and join the gang? And everyone knows that informal communication and information does occur during such bonding sessions – which I would probably be losing out on. Or when someone cracked a sexist joke or passed a distasteful comment on some woman walking by however harmless it might be, how should I react? Should I just laugh and join in the fun and be “one of the boys”? Or should I show the fact that I do not appreciate such talk at the risk of sounding too prudish or too stuck up? Or should I just fake indifference? Apart from these issues, Suits also talks about the pressure and stress of working in a highly competitive environment, which is blatantly focused on making revenue and coming first in the rat race, than ethics or morals. While those on the outside, might only notice the flashy lifestyle it is a fact that many workers face emotional breakdowns as they are unable to handle the constant overload and the isolation that accompanies a life of almost zero work-life balance. As Nina sees herself gradually being swept away by it all and turning into one of “them”, she is forced to take a relook at her dreams and ideals. Along the lines, we are also offered a glimpse of Nina’s home and family life, right from childhood. Her Parsi family sounds like a typical middle-class Indian family, or maybe even any immigrant family bent on working-hard and saving money for securing their children’s future and hoisting their own dreams and hopes onto their kids. And we see the little girl in Nina, who wants to prove – to herself, to her dad, to the world – that yes she can do it, she can fulfill all those expectations, that she is worthy of their love and admiration. These chapters contain some of the most heart-warming and humorous incidents in the book. And in the end, it is also her family that stands solidly by her and keeps her sane and grounded. Nina says that when she was writing the book, she wasn’t expecting anyone to read it. Maybe that’s why she manages to tell a honest story, dil se. Yes you should chk it out Ash. Yeah if only we could all write that way! Sigh!